These gorgeous new felted wool rugs are produced for us in Nepal using wool from the hardy mountain Bharuwal sheep. 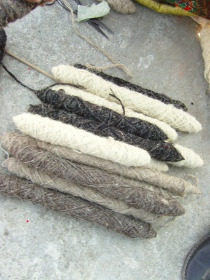 The soft light- and mid-grey of the thick yarn are not dyed, but the natural colour of the hand spun wool. The rugs are woven on back strap looms by weavers on the roof of a house in Kathmandu, and then washed in hot water to felt the wool. The rugs, which are extremely warm, are often used as blankets against the cold and rain in Nepal, as well as being commonly used as floor coverings. Available initially in three designs, Stitch by Stitch have reinterpreted traditional woven motifs to produce a modern, rustic look. Each rug measures 144 x 166cm, although special sizes are also available to order. The rugs are currently available to order through Stitch by Stitch and Livingstone Studio in Hampstead, where they are displayed as part of their Fresh from the Drawing Board exhibition (until 30 November). We will be previewing the rugs at the Selvedge Winter Fair in November.